I am a long time listener to podcasts. Originally, I listened to podcasts using my iPod Touch, but the iPod then didn’t provide a way to make a playlist of podcasts so once an episode completed you had to manually start the next episode, which was not very safe while driving. I started by listening to the Daily Source Code produced by Adam Curry but today I listen mostly to shows on the TWiT network. Shortly after I got my first Android phone I bought DoggCatcher, which I think may have been one of the very first podcasting apps for Android. While I was happy using DoggCatcher, when Google Listen became available I was drawn to it by the ability to manage your podcast subscription lists using Google Reader. I also liked how Listen automatically put new episodes at the top of the playlist making it easy for me to quickly find the latest and greatest episodes of the podcasts I follow. Unfortunately, Google retired Listen, but it didn’t “disappear” from my Galaxy Nexus, so I kept using it until the Nexus’ untimely demise. With my Galaxy Nexus no longer functioning, I had to find a replacement for Google Listen to install on the Samsung Galaxy S2 provided by my employer, so I went back to DoggCatcher. DoggCatcher has improved significantly since I used it last and I am particularly happy with its Android lock screen controls. With Google retiring Listen, it is no longer easy to install it on a new Android phone, although I believe that you can manually find and install it from your apps list in Google Play. An increase in using my work provided smartphone during my commutes has forced me to either pick the Galaxy S or the HTC One for listening to all podcasts, or find a way to sync what I listen to between the two phones. DoggCatcher has a cloud synchronization function that is in development but is not available to me now. I learned that Pocket Casts has a working sync function, and with a $25 Google Play store credit, I decided to go ahead and buy it to check out. 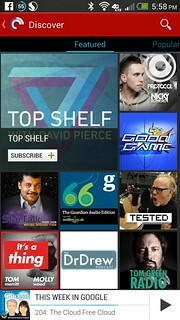 In another article I will write about how Pocket Casts meets my criteria for podcast apps.